Sir Thomas Blunt gazed at the envelope again. Joviality and benevolence resumed their thrones. Those were his amazing words. They slipped out. He could not stop them. Sir Thomas was taken aback for an instant, but not seriously. He started as might a man who, stroking a cat, receives a sudden but trifling scratch. “Twenty pounds, eh?” he said, reflectively. Then the milk of human kindness swept over displeasure like a tidal wave. This was a night for rich gifts to the deserving. His lordship replied that he did, please; and he had seldom said a thing more fervently. He led the way to his dressing-room. Like nearly all the rooms at the castle, it was large. One wall was completely hidden by the curtain behind which Spike had taken refuge that afternoon. Sir Thomas went to the dressing-table and unlocked a small drawer. Lord Dreever muttered his thanks. Sir Thomas accepted the guttural acknowledgment with a friendly pat on the shoulder. “I like a little touch like that,” he said. His lordship, crackling the four bank-notes, silently agreed with him. He turned to the dressing-table and removed his collar. His lordship tottered from the room. He did quite an unprecedented amount of thinking as he hurried into his evening clothes; but the thought which occurred most frequently was that, whatever happened, all was well in one way, at any rate. He had the twenty pounds. There would be something colossal in the shape of disturbances when his uncle learned the truth. It would be the biggest thing since the San Francisco earthquake. But what of it? He had the money. He slipped it into his waistcoat pocket. He would take it down with him, and pay Hargate directly after dinner. He left the room. The flutter of a skirt caught his eye as he reached the landing. A girl was coming down the corridor on the other side. He waited at the head of the stairs to let her go down before him. As she came on to the landing he saw that it was Molly. For a moment there was an awkward pause. “Er—I got your note,” said his lordship. She looked at him, and then burst out laughing. He caught her eye. Next moment they were laughing together. They clasped hands; and it was in this affecting attitude that Sir Thomas Blunt, bustling downstairs, discovered them. Molly flushed uncomfortably; partly because she disliked Sir Thomas even when he was not arch, and hated him when he was; partly because she felt foolish; and principally because she was bewildered. She had not looked forward to meeting Sir Thomas that night. It was always unpleasant meeting him, but it would be more unpleasant than usual after she had upset the scheme for which he had worked so earnestly. She had wondered whether he would be cold and distant or voluble and heated. In her pessimistic moments she had anticipated a long and painful scene. That he should be behaving like this was not very much short of a miracle. She could not understand it. A glance at Lord Dreever enlightened her. That miserable creature was wearing the air of a timid child about to pull a large cracker. He seemed to be bracing himself up for an explosion. She pitied him sincerely. So he had not told his uncle the news yet! Of course, he had scarcely had time. Saunders must have given him the note as he was going up to dress. However, there was no use in prolonging the agony. Sir Thomas must be told sooner or later. She was glad of the chance to tell him herself. She would be able to explain that it was all her doing. “I’m afraid there’s a mistake,” she said. Sir Thomas’s always prominent eyes protruded still farther. The colour of his florid face deepened. Suddenly he chuckled. Molly looked at him amazed. Sir Thomas was indeed behaving unexpectedly to-night. She was aware that his lordship had emitted a hollow croak, but she took it as his method of endorsing her statement—not as a warning. She broke off in alarm. With the beginning of her last speech Sir Thomas had begun to swell, until now he looked as if he were in imminent danger of bursting. His face was purple. To Molly’s lively imagination his eyes appeared to move slowly out of his head, like a snail’s. From the back of his throat came strange noises. He gulped and tried again. Lord Dreever, a limp bundle against the banisters, smiled weakly. Sir Thomas eyed him with a baleful stare. Molly looked from one to the other in bewilderment. There was a pause, during which Sir Thomas seemed partially to recover command of himself. Doubts as to the propriety of a family row in mid-stairs appeared to occur to him. He moved forward. “Come with me,” he said, with awful curtness. His lordship followed bonelessly. Molly watched them go, and wondered more than ever. There was something behind this. It was not merely the breaking-off of the engagement that had roused Sir Thomas. He was not a just man, but he was just enough to be able to see that the blame was not Lord Dreever’s. There had been something more. She was puzzled. In the hall Saunders was standing, weapon in hand, about to beat the gong. Dinner had been ordered especially early that night because of the theatricals. The necessity for strict punctuality had been straitly enjoined upon Saunders. At some inconvenience he had ensured strict punctuality. And now—— But we all have our cross to bear in this world. Saunders bowed with dignified resignation. Sir Thomas led the way into his study. “Be so good as to close the door,” he said. His lordship was so good. Sir Thomas backed to the mantelpiece and stood there in the attitude which for generations has been sacred to the elderly Briton—feet well apart, hands clasped beneath his coat tails. His stare raked Lord Dreever like a searchlight. His lordship wilted before his gaze. He spread his feet farther apart. The years had rolled back, and he was plain Thomas Blunt again, of Blunt’s Stores, dealing with an erring employé. His lordship said that somehow, don’t you know, there didn’t seem to be a chance, you know. He had several times been on the point—but—well, somehow—— Well, that’s how it was. There was a very fair selection of evil-doers in all branches of business from which to choose. He gave the preference to the race-track. His lordship’s face betrayed the deepest consternation. He had been prepared for much, but not for this. That he would have to undergo what in his school-days he would have called “a jaw” was inevitable, and he had been ready to go through with it. It might hurt his feelings, possibly, but it would leave his purse intact. A ghastly development of this kind he had not foreseen. “But, I say, uncle!” he bleated. Sir Thomas silenced him with a grand gesture. Ruefully his lordship produced his little all. Sir Thomas took it with a snort and went to the door. Saunders was still brooding statuesquely over the gong. “Sound it!” said Sir Thomas. Saunders obeyed him with the air of an unleashed hound. The butler’s calm, expressionless, yet withal observant eye took in at a glance the signs of trouble. Neither the inflated air of Sir Thomas nor the punctured-balloon bearing of Lord Dreever escaped him. He reserved his more polished periods for use in public. In conversation with his immortal soul he was wont to unbend somewhat. Gloom wrapped his lordship about during dinner as with a garment. He owed twenty pounds; his assets amounted to seven shillings and fourpence. He thought, and thought again. Quite an intellectual pallor began to appear on his normally pink cheeks. Saunders, silently sympathetic—he hated Sir Thomas as an interloper, and entertained for his lordship, under whose father also he had served, a sort of paternal fondness—was ever at his elbow with the magic bottle; and to Spennie, emptying and re-emptying his glass almost mechanically, wine, the healer, brought an idea. To obtain twenty pounds from any one person of his acquaintance was impossible; to divide the twenty by four and persuade a generous quartet to contribute five pounds apiece was more feasible. Hope began to stir within him again. Immediately after dinner he began to flit about the castle like a family spectre of active habits. The first person he met was Charteris. Two minutes later Lord Dreever had resumed his hunt. The path of the borrower is a thorny one, especially if, as in the case of Spennie, his reputation as a payer-back is not of the best. Spennie in his time had extracted small loans from most of his male acquaintances, rarely repaying the same. He had a tendency to forget that he had borrowed half a crown here to pay a cab fare and ten shillings there to settle up for a dinner; and his memory was not much more retentive of larger sums. This made his friends somewhat wary. The consequence was that the great treasure-hunt was a failure from start to finish. He got friendly smiles, he got honeyed apologies, he got earnest assurances of goodwill; but he got no money, except from Jimmy Pitt. He had approached Jimmy in the early stages of the hunt, and Jimmy, being in the mood when he would have lent anything to anybody, yielded the required five pounds without a murmur. But what was five pounds? The garment of gloom and the intellectual pallor were once more prominent when his lordship repaired to his room to don the loud tweeds which, as Lord Herbert, he was to wear in the first act. There is a good deal to be said against stealing, as a habit; but it cannot be denied that, in certain circumstances, it offers an admirable solution of a financial difficulty, and, if the penalties were not so exceedingly unpleasant, it is probable that it would become far more fashionable than it is. His lordship’s mind did not turn immediately to this outlet from his embarrassment. He had never stolen before, and it did not occur to him directly to do so now. There is a conservative strain in all of us. But gradually, as it was borne in upon him that it was the only course possible, unless he were to grovel before Hargate on the morrow and ask for time to pay—an unthinkable alternative—he found himself contemplating the possibility of having to secure the money by unlawful means. By the time he had finished his theatrical toilet, he had definitely decided that this was the only thing to be done. His plan was simple. He knew where the money was—in the dressing-table in Sir Thomas’s room. He had heard Saunders instructed to put it there. What could be easier than to go and get it? Everything was in his favour. Sir Thomas would be downstairs receiving his guests. The coast would be clear. Why, it was like finding the money. Besides, he reflected, as he worked his way through the bottle of Mumm which he had had the forethought to abstract from the supper-table as a nerve-steadier, it was not really stealing. Dash it all, the man had given him the money! It was his own! He had half a mind—he poured himself out another glass of the elixir—to give Sir Thomas a jolly good talking-to into the bargain. Yes, dash it all! He pushed on his cuffs fiercely. The British lion was roused. A man’s first crime is, as a rule, a shockingly amateurish affair. Now and then, it is true, we find beginners forging with the accuracy of old hands or breaking into houses with the finish of experts. But these are isolated cases. The average tyro lacks generalship altogether. Spennie Dreever may be cited as a typical novice. It did not strike him that inquiries might be instituted by Sir Thomas when he found the money gone, and that suspicion might conceivably fall upon himself. Courage may be born of champagne, but rarely prudence. The theatricals began at half-past eight with a duologue. The audience had been hustled into their seats, happier than is usual in such circumstances, owing to the rumour which had been circulated that the proceedings were to terminate with an informal dance. The castle was singularly well constructed for such a purpose. There was plenty of room and a sufficiency of retreat for those who sat out, in addition to a conservatory large enough to have married off half the couples in the country. 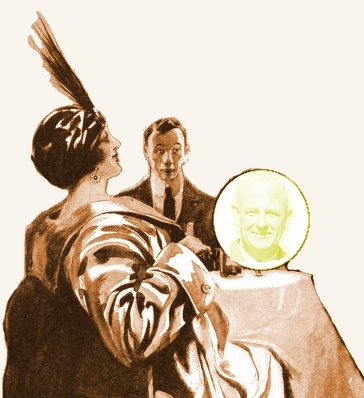 Spennie’s idea had been to establish an alibi by mingling with the throng for a few minutes, and then to get through his burglarious speciality during the duologue, when his absence would not be noticed. It might be that if he disappeared later in the evening people would wonder what had become of him. He lurked about till the last of the audience had taken their seats. As he was moving off through the hall a hand fell upon his shoulder. Conscience makes cowards of us all. Spennie bit his tongue and leaped three inches into the air. “Halloa, Charteris!” he said, gaspingly. Charteris appeared to be in a somewhat overwrought condition. Rehearsals had turned him into a pessimist, and now that the actual moment of production had arrived his nerves were in a thoroughly jumpy condition, especially as the duologue was to begin in two minutes and the obliging person who had undertaken to prompt had disappeared. Spennie went reluctantly. Half-way through the duologue the official prompter returned, with the remark that he had been having a bit of a smoke on the terrace and that his watch had gone wrong. Leaving him to discuss the point with Charteris, Spennie slipped quietly away. The delay, however, had had the effect of counteracting the uplifting effects of the Mumm. The British lion required a fresh fillip. He went to his room to administer it. By the time he emerged he was feeling just right for the task in hand. A momentary doubt occurred to him as to whether it would not be a good thing to go down and pull Sir Thomas’s nose as a preliminary to the proceedings; but he put the temptation aside. Business before pleasure. With a jaunty, if somewhat unsteady, step he climbed the stairs to the floor above and made his way down the corridor to Sir Thomas’s room. He switched on the light and went to the dressing-table. The drawer was locked, but in his present mood Spennie, like Love, laughed at locksmiths. He grasped the handle and threw his weight into a sudden tug. The drawer came out with a report like a pistol-shot. “There!” said his lordship, wagging his head severely. In the drawer lay the four bank-notes. The sight of them brought back his grievances with a rush. He would teach Sir Thomas to treat him like a kid! He would show him! He was removing the notes, frowning fiercely the while, when he heard a cry of surprise from behind him. He turned, to see Molly. She wore the costume of a stage milkmaid, and her eyes were round with wonder. Leaving her room a few moments earlier after dressing for her part, she had almost reached the end of the corridor that led to the landing, when she observed his lordship, flushed of face and moving like some restive charger, come curveting out of his bedroom in a dazzling suit of tweeds and make his way upstairs. Ever since their mutual encounter with Sir Thomas before dinner she had been hoping for a chance of seeing him alone. She had not failed to notice his depression during the meal, and her good little heart had been troubled by the thought that she must have been responsible for it. She knew that for some reason what she had said about the letter had brought his lordship into his uncle’s bad books, and she wanted to find him and say she was sorry. Accordingly, she had followed him. His lordship, still in the war-horse vein, had made the pace upstairs too hot, and had disappeared while she was still half-way up. She had arrived at the top just in time to see him turn down the passage into Sir Thomas’s dressing-room. She could not think what his object might be. She knew that Sir Thomas was downstairs, so it could not be with the idea of a chat with him that Spennie was seeking the dressing-room. Faint, yet pursuing, she followed on his trail, and arrived in the doorway just as the pistol-report of the burst lock rang out. She stood looking at him blankly. He was holding a drawer in one hand. Why, she could not imagine. The sombre determination of his lordship’s face melted into a twisted but kindly smile. He waved the drawer benevolently, by way of making her free of the room. The movement disturbed one of the bank-notes, which fluttered in Molly’s direction and fell at her feet. She stooped and picked it up. When she saw what it was her bewilderment increased. His lordship beamed upon her with a pebble-beached smile of indescribable goodwill. “Opening drawer,” said his lordship, affably. Still she could not understand. His lordship drew himself up. His lordship gave the drawer a dignified wave. His lordship raised his eyebrows. “Wanted touch him twenty of the best,” he explained, simply. For the life of her Molly could not help laughing. He removed the three notes and replaced the drawer. “Honour of the Dreevers!” he added, pocketing the money. His lordship wagged a forefinger very solemnly at her. Molly wrinkled her forehead in her agitation. Men of Lord Dreever’s type appeal to the motherly instinct of women. As a man his lordship was a negligible quantity. He did not count. But as a wilful child, to be kept out of trouble, he had a claim on Molly. “But, Lord Dreever——” she began. “Call me Spennie,” he urged. “We’re pals. You said so. On stairs. Everybody calls me Spennie. Even Uncle Thomas. I’m going to pull his nose,” he broke off suddenly, as one recollecting a forgotten appointment. “You look rippin’ in that dress,” he said, irrelevantly. She took the notes from him, and replaced them in the drawer. He watched her thoughtfully, as if he were pondering the merits of her arguments. She pushed him gently away. “Something in that,” admitted his lordship. She stopped. She had closed the door earlier in the proceedings, but her quick ear caught the sound of a footstep in the passage outside. She pushed him behind the curtain where the clothes hung, and switched off the light. From behind the curtain came the muffled voice of his lordship. She sprang to the curtain and slipped noiselessly behind it. “But, I say——” began his lordship. She gripped his arm. He subsided. The footsteps had halted outside the door. Then the handle turned softly. The door opened and closed again with hardly a sound. The footsteps passed on into the room. touch: The informal sense of the word, meaning to ask someone for a loan (or, usually in practice, a gift) of money, dates back to the eighteenth century and is common among Wodehouse’s idlers, but is rarer these days. Spennie’s confusing this sense with Sir Thomas’s reference to the romantic touch of letter-writing makes for a good opportunity to point out the older slang definition. San Francisco earthquake: The April 18, 1906 quake (and its subsequent, far more destructive fire)—a relatively recent event when this was written. 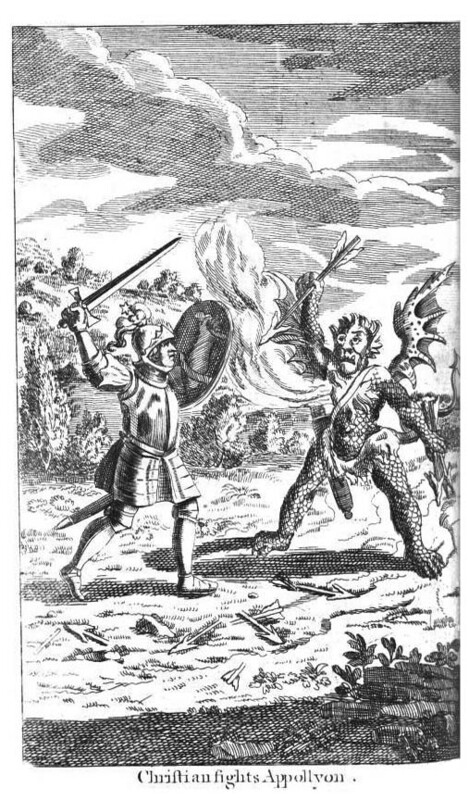 Apollyon: a dragon-like archdevil in John Bunyan’s allegory The Pilgrim’s Progress. The image at right is an engraving by John Sturt for the 1728 edition. fair old, rare old: The closing line of “Strolling Round the Town,” an 1893 music-hall song by Harry Castling (1865–1933), was “We’re a fair old, rare old, rickety-rackety crew.” The line was also made famous as the caption of a Punch cartoon by Phil May. toilet: here, the process of dressing or grooming one’s clothing or hair; from Fr. toilette, small cloth or towel, such as a hairdresser or barber’s protective wraparound. Love laughs at locksmiths: title of an 1803 comic opera by George Colman the Younger (1762–1836) with music “composed and selected” by Michael Kelly (1762–1826).